When Michael Moreci isn't busy writing a hundred other comic books he's creating entirely new and exciting ones. 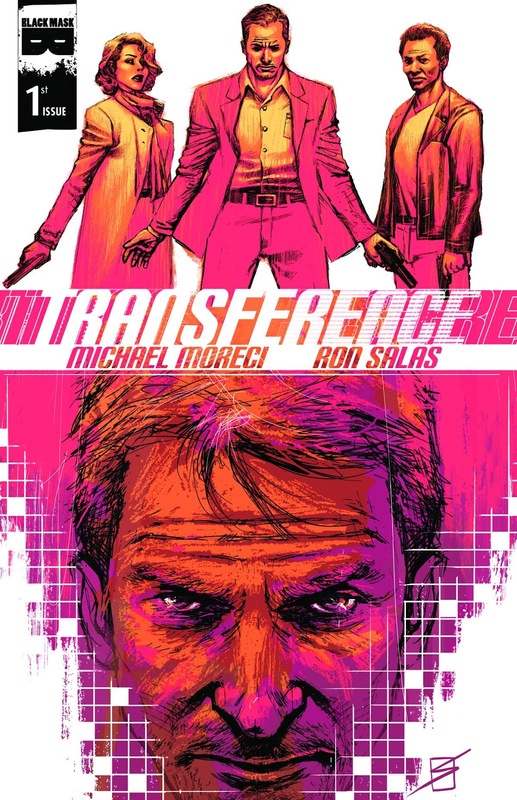 His latest book to debut is Transference #1 (Black Mask Studios) and this is what happens when you take cool sci-fi elements and add intriguing spy drama you get a twisty, mind-bending, time-traveling thriller. Coulton leads an elite group of agents who, for a price, can go back in time and alter the present by making minor changes. As the story unfolds things have already taken a wrong turn and Coulton's team is trying to correct it. You would think that having the ability to redo your mistakes by time travel would be an easy fix, but it's much more complicated when you discover you're not the only game in town. One of the universal rules of time travel has always been that even the smallest change can have a major ripple effect through the stream of space and time. It's a delicate situation for Coulton and the team as things go haywire and the problems become greater and greater as the plot moves forward. Transference gets its energy from artist Ron Salas' lean, murky lines and hardened character designs. You know right away these are serious professionals at work and thus the stakes are high and the job is dangerous. Colorist Tamra Bonvillain does an incredible job of washing time travel scenes with a ghostly atmosphere that is menacing in its calm. The pace is smooth and quick, but the development of Coulton, for example, is hampered because of it. We're likely going to get to know him better as the series progresses and as usual Moreci's skill at dialogue helps to reveal some of his character. Still, minor quibbles aside, Transference #1 is high concept with great ambitions that make it worth adding to your pull list to see where this sci-fi/spy thriller takes you.